Happy Halloween! Today is the 30th Wiki Wednesday! Schwerkraft bedeutet zum Beispiel, dass eine Figur von oben auf den Boden fallen kann, außer, wenn ein Hindernis im Weg ist. 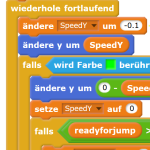 Diese Funktionen braucht man oft bei Jump'n'Run-Games. A Scratch Design Studio Curator, or a SDS Curator, is a curator selected to add projects to the Scratch Design Studio. The Scratch Design Studio is a themed studio run by the Scratch Team that appears on the front page and is changed approximately every month. Il est parfois pratique d'avoir plusieurs lutins avec le même comportement sans avoir à en créer plusieurs. C'est justement ce que vous permet les clones d'un lutin dans Scratch. Apprenez-en plus sur leur fonctionnement dans l'article présenté ce mois-ci. Страница профиля - это страница Скретчера. Чтобы перейти на эту страницу, нажмите на пункт “Профиль” из выплывающего меню на панели инструментов или нажмите на имя Скретчера около комментария, проекта или сообщения на форуме. …dass du dir unter “Weitere Blöcke” eigene Blöcke zusammenstellen kannst? Did you know? Scratch Design Studio curators can recommend other people to become curators, subject to Scratch Team approval. Credit to Scratch for the header. Credit to Yummygum on iconfinder.com for the flag icons! Thank you to Kenny2scratch for organizing this Wiki Wednesday and preparing this topic. Nice Wiki Wednesday, great work! I almost missed this Wiki Wednesday because the Scratch frontpage still links to the previous one. 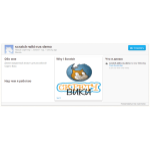 BTW, finally someone joined to the Turkish Scratch Wiki! Hey Wiki Wednesday! I will donate a generous follow! Good Luck! I am excited for the 3.0 update! Hi! You might already know that I have been commenting on MANY Wiki Wednesdays, but I also go to Japan a LOT. "Darkness is just a place without any light." What's the next theme 4 the SDS? Wonderful Choice of articles this month! Me too! I can't wait to put up my project! On Scratch 3.0, I have a saved project and can't wait till I get to share it!